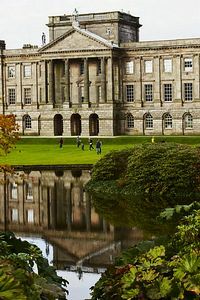 Lyme Park Hall, set in 1,000 acres of deer park, closely resembles "Pemberley", the home of Mr Darcy in the BBC's drama of the Jane Austen classic, Pride and Prejudice. The estate was actually used for the filming, along with many other dramas. This hunting estate in Cheshire was acquired by Sir Thomas Danyers way back in 1346. 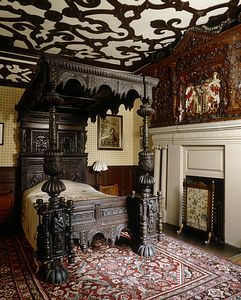 It was passed by marriage to the Legh family where it remained until 1946 when financial expediency required that it be passed to the National Trust after 600 years of family ownership. In the early 19th century further modifications were made to the interior by Lewis Watts and he remodelled every room. He added a "hamper", which was the tower-like addition, on the roof to provide staff accommodation. 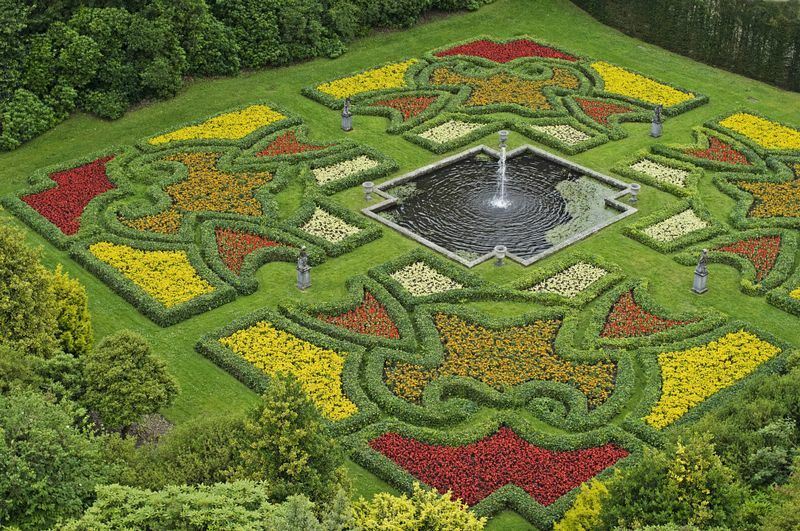 Following on from Thomas Legh, William Legh, 1st Baron Newton added stables and created the Dutch Garden which can be enjoyed today. The final owner of the Legh family, after 600 years of occupancy, was Richard, 3rd Baron Newton. He donated Lyme Park in 1946 to the National Trust. The sandstone building of Lyme Hall has three main floors and is entered through the pillared portico. The hall is built around a courtyard, which has an Italian Renaissance water feature and cloisters on all four sides. 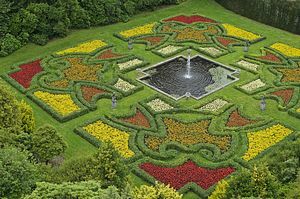 The formal gardens were created later, in the late 19th and early 20th century. A tour of the house will reveal a portrait of the Black Prince who was connected with Lyme Hall. There is a squint, or looking panel, from the hall into the Elizabethan Great Chamber. The Drawing Room deserves a special mention for its medieval stained glass windows. Lyme Hall also has a fine collection of antique clocks. Lyme Park has some fine Mortlake tapestries, dating back to 1623, and most of the furniture was bought in wealthier times during the late 18th century by the owner, Piers Legh XIII. The library holds one of the most unique treasures - the only surviving copy of the Sarum Missal, published in two colours by William Caxton in 1487. Lyme Hall has 17 acres of impressive gardens including a Rose Garden and a sunken Dutch Garden, with a pond, fountain and four statues representing the elements of earth, fire, air and water. Look at the floor of the Orangery to see the initials of the 1st Baron Newton, William Legh. The fig tree on the back wall of this conservatory is 90 years old and the two unidentified species of camellia are 175 years old. The reflecting lake in front of the house had two purposes: one was to make a beautiful outlook from the house, and the second, more practical use, was that a pumphouse was fitted in 1902 to protect the house in case of fire. Further from the house, the extensive parkland has herds of red and fallow deer with miles of walks and a children's play area. The main structure within Lyme Park estate is the former hunting lodge, known as the Cage, which has recently been renovated. It was used as a watchtower from which the stag hunts could be viewed.